My great aunt made me a much smaller version of that afghan, same pattern and color scheme, to keep my knees warm in my chilly Volkswagen beetle as I drove to college – again over 40 years ago,. i still have mine in my car and many happy memories. Still no hummingbirds here but hopefully they are on the way. I bet they are heading north. You’ve given me a good reminder to get out my hummingbird feeder! If you have some arriving, mine can’t be far behind! They should be heading your way soon. We have a couple of lines strung on the deck for laundry, and have not been able to buy one of that style of clothesline, although I want one. I will keep looking. Enjoy your birds! We have tons of chippies and squirrels, Pegleg the raven with one foot, some red birds–orioles? 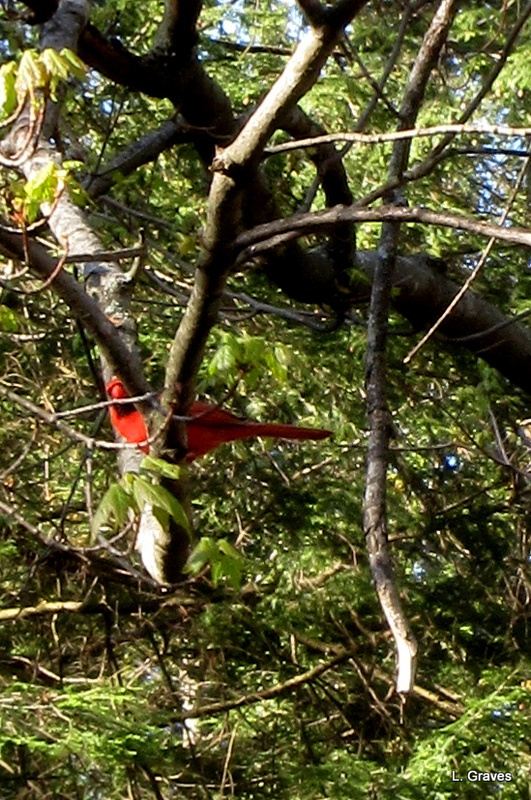 cardinals?, some little fast ones, plenty of mourning doves, and the big bluejays come by now and again. We scowl but do not yell at the falcon that comes by once in a while to try his luck and send him on his way without eating our friends. We have some deer that come by, and I have seen a red fox twice in the last couple of weeks in our yard. All this plus forsythias and gorgeous flowering crabapples and lilacs nearby are so great. Enjoy! It is such an exciting time of year. 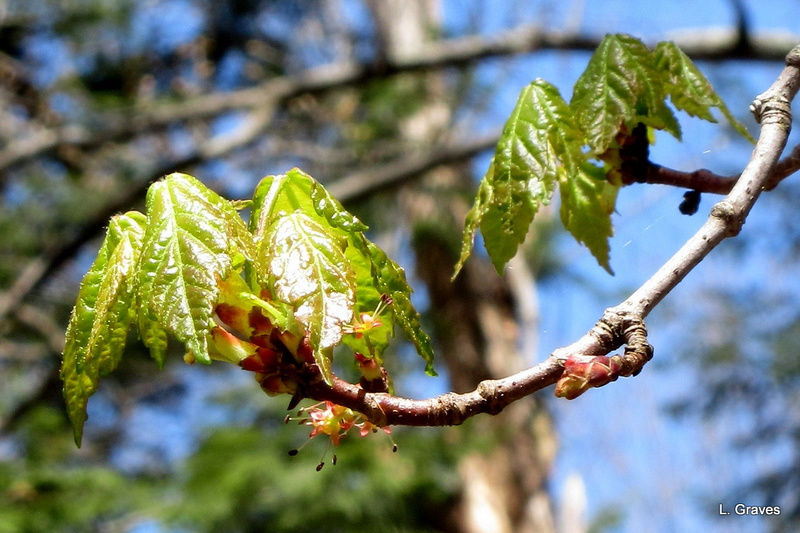 All those chartreuse baby leaves unfurling against the blue sky is heaven on earth! Getting the washing out is a pivotal moment. Sure is! Funny how something so old fashioned can feel so joyful. Such a beautiful blanket…like a rainbow! Thanks, Betsy! Hope those sick birds make a full and speedy recovery. I love your quilt and your birds! 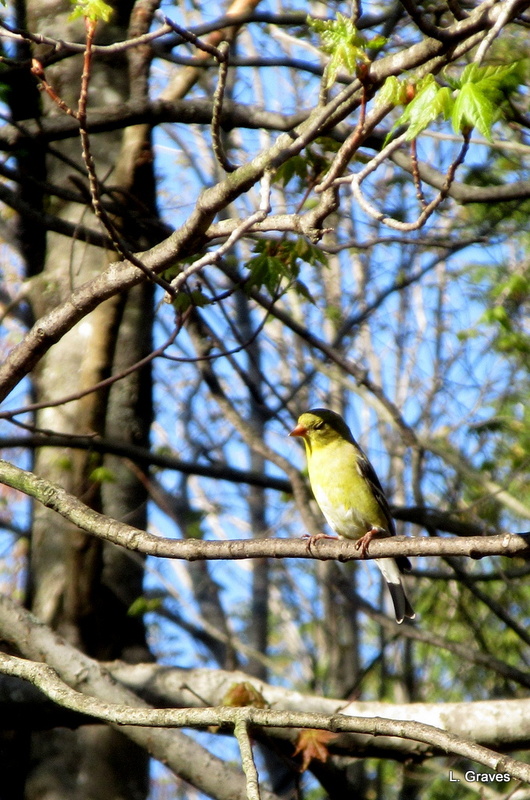 The male Goldfinch is very summery with his bright yellow feathers & the male Cardinal is very striking too. I look forward to seeing the Hummingbird… We’re a bit short on well behaved birds here in Australia! Oh, but you sure do have some beauties, even if they are not well behaved. What a fabulous blanket – so good to see it out in the sunshine. You have some wonderfully colourful birds in your neck of the woods Laurie. No hummingbirds here, so I look forward to seeing yours. Once, when I was in Colorado (1994), meditating on a rock, a hummigbird came to see if it could get nectar from my ear! One of the most magical things that has ever happened to me. Their sweet tinlkly sound is what I remember so clearly. The whirring of tiny wings, so fast that they are a blur. I do love that blanket. Colorful, sturdy, and warm. It seems that everyone here, 15 miles from Quebec, has a mémère! How lucky for you, to have that beautiful blanket! Is it crocheted? Such a pretty pattern. I hung towels and pillowcases out on the line yesterday, even though it was about 38 degrees here. Your wee camera does a great job. Yes, it was crocheted. Nice to think of how folks in other parts of the United States have a mémère. 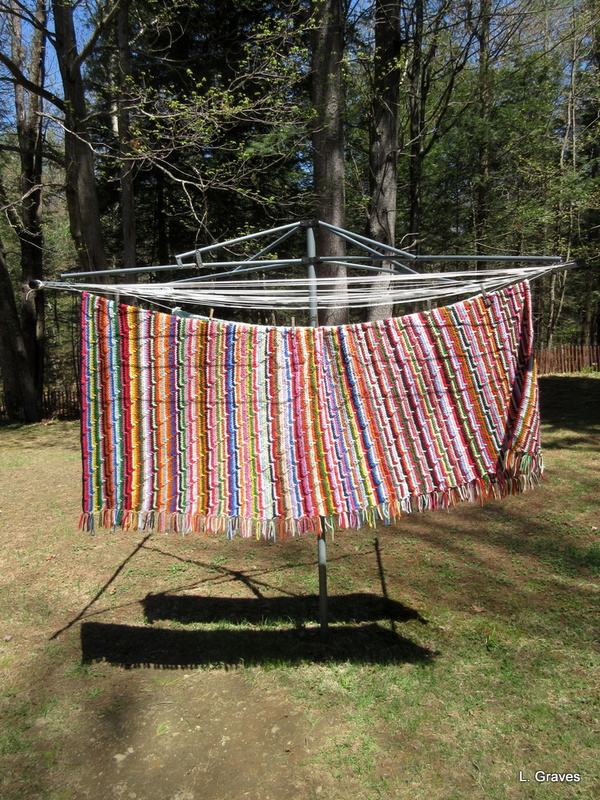 I used to help my grandmother hang out the washing, as she called it, and she was downright giddy in spring. I’m so glad that spring has finally arrived in Maine. May it last a good long time! Spring has truly sprung in your neighborhood. 🙂 Yes, please show us more beautiful birds. Not easy with my little camera, but I will keep on trying. That blanket is lovely. 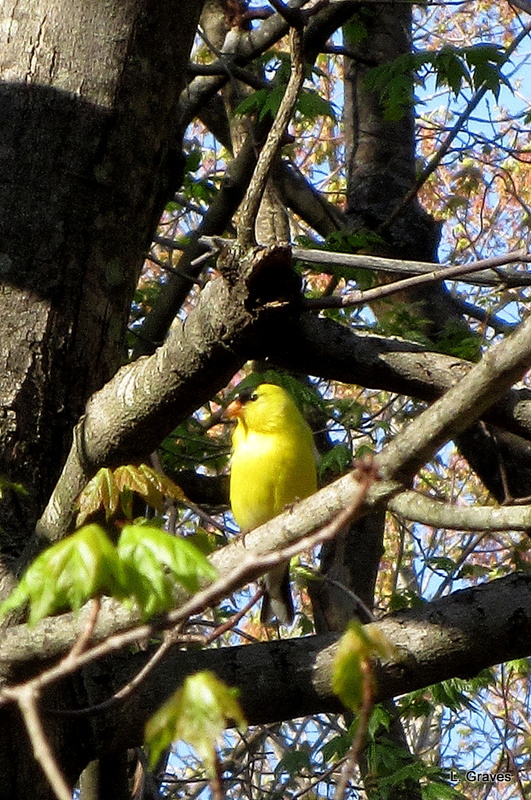 I took a long morning walk yesterday reveling in the emerging baby leaves and birds. It was heaven. Thanks, Brenda. Spring, even when it is slow to come, is such a glorious time. I love your blanket! May it be found on your washing-line for many years to come! I also find hanging out washing on the line a joyful occupation. I love to watch it flapping in the breeze and the smell of it too, so fresh and sweet! It is 8.15 in the evening and still light and there are towels hanging on the line yet! Your photos of your bird visitors are excellent! So glad to learn I am not the only one who is enthralled with laundry on the line.